This is the fourth in a series of posts exploring What’s New in BizTalk Server 2013 R2. It is also the second in a series of three posts covering the enhancements to BizTalk Server’s support for RESTful services in the 2003 R2 release. 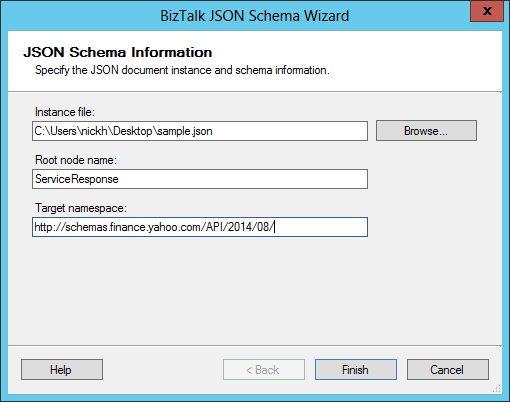 In my last post, I wrote about the support for JSON Schemas in BizTalk Server 2013 R2. I started out with a small project that included a schema generated from the Yahoo Finance API and a unit test to verify the schema model. I was going to put together a follow-up article last week, but spent the week traveling, in the hospital, and then recovering from being sick. However, I am back and ready to tear apart the next installment that already hit the github repo a few days back. In BizTalk Server 2013 R2, Microsoft approached the problem of dealing with JSON content in a way fairly similar to the approach that we used in the previous version with custom components – performing the JSON conversion as an operation in the Decode stage of the pipeline, thus requiring the Disassemble stage to include an XMLDisassemble component for property promotion. 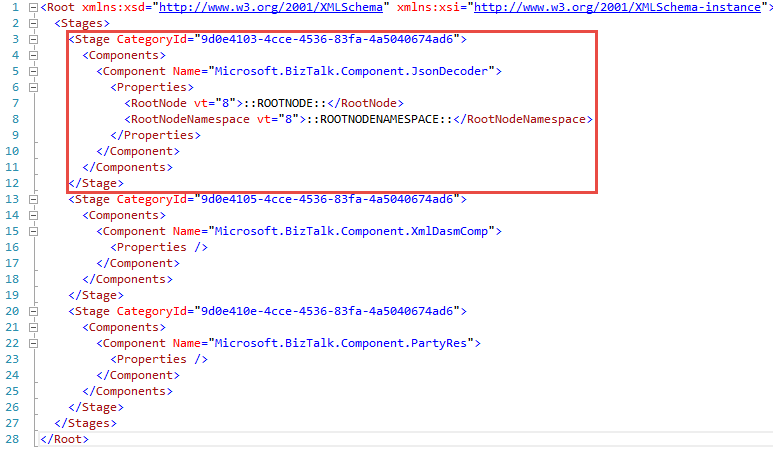 The official component Microsoft.BizTalk.Component.JsonDecoder takes in two properties Root Node and Root Node Namespace that help determine how the XML message will be created. Finally, there isn’t a JSONReceive pipeline included in BizTalk Server 2013 R2 – only the pipeline component was included. In other words, in order to work with JSON, you will need a custom pipeline. Ultimately, I would like to create a pipeline that is going to be reusable so that I don’t have to create a new pipeline for each and every message that will be received. 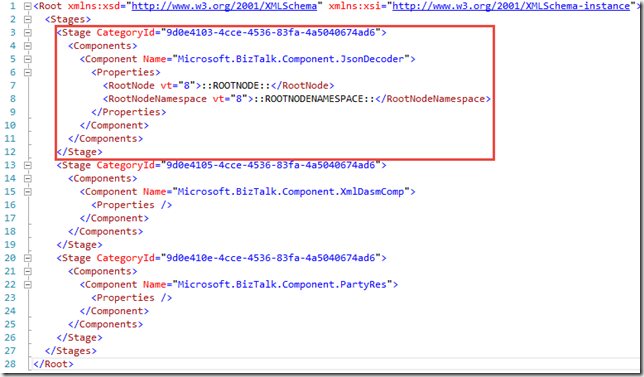 Since BizTalk message types are all about the target namespace and root node name, it’s not reasonable to set that value to be the same for every message – despite having different message bodies and content. As a result, it might be best to leave the value blank and only set it at design time. This is also an interesting constraint, because if we are receiving this message not necessarily just as a service response, we might end up needing to create a fairly flexible schema (i.e., with a lot more choice groups) depending on the variety of inputs / responses that may be received – something that will not be explored within this blog post, but would be an excellent discussion to bring up during one of QuickLearn’s BizTalk Server Developer Deep Dive classes. 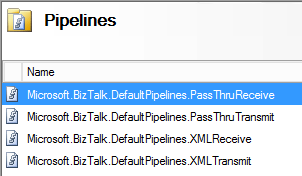 In order to make the pipeline behave in a way that will be consistent with typical BizTalk Server message processing, I decided to essentially take what we have in the XMLReceive pipeline and simply add a JsonDecoder in the Decode stage, with none of its properties set at design time. In the same vein as my last post, I will be creating automated tests for the pipeline to verify its functionality. However, we cannot use the built-in support for testing pipelines in this case – because properties of the pipeline were left blank, and the TestablePipelineBase class does not support per instance configuration. Luckily, the Winterdom PipelineTesting library does support per instance configuration – and it has a nifty NuGet package as of June. Unfortunately, the per-instance configuration is not really pretty. It requires an XML configuration file that resembles the guts of a bindings file in the section dedicated to the same purpose. In other words, it’s not as easy as setting properties on the class instance in code in any way. To get around that to some degree, and to be able to reuse the configuration file with different property values, I put together a template with tokens in place of the actual property values. NOTE: If you’re copying this approach for some other pipeline components, the vt attribute is actually very important in ensuring your properties will be read correctly. See KB884981 for details. The final test code includes a validation of the output against the schema from last week’s post. As a result, we’re really dealing with an integration test here rather than a unit test, but it’s a test nonetheless. After giving it a run, it looks like we have a winner. In the next installment of this series, I will actually put to use what we have here, and build out a more complete integration that allows us to experience sending JSON messages as well, using the new JsonEncoder component. This is the third in a series of posts exploring What’s New in BizTalk Server 2013 R2. It is also the first in a series of three posts covering the enhancements to BizTalk Server’s support for RESTful services in the 2003 R2 release. It also yielded some good discussion of the same over on the connectedcircuits blog, wherein some glitches in my sample code were addressed – many thanks for that! All of that having been said, similar components in one form or another are now available out of the box with BizTalk Server 2013 R2 – and I must say the integrated VS 2013 tooling blows away a 5 minute WinForms app. 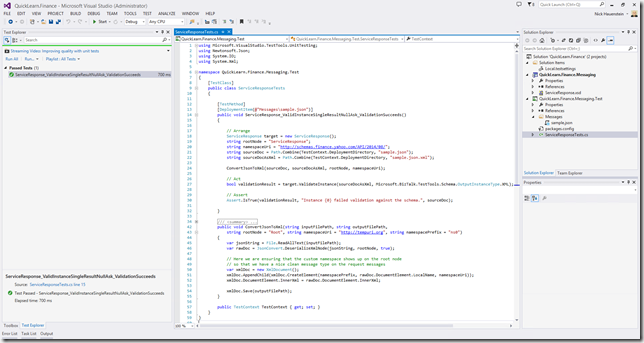 In this post we will begin an in-depth examination of this improved JSON support by first exploring the support for JSON Schemas within a BizTalk Server 2013 R2 project. How Does BizTalk Server Understand My Messages? All BizTalk Server message translation occurs at the intersection between 2 components: (1) A declarative XSD file that defines the model of a given message, with optional inline parsing/processing annotations, and (2) an executable pipeline component (usually within the disassemble stage of a receive pipeline or assemble stage of the send pipeline) that reads the XSD file and uses any inline annotations necessary to parse the source document. This is the case for XML documents, X12, EDIFACT, Flat-file, etc… It only logically follows then that this model could be extended for JSON. In fact, that’s exactly what the BizTalk Server team has done. 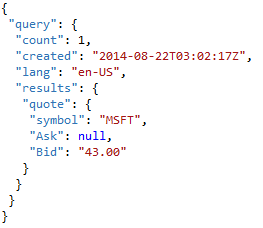 JSON is an interesting beast however, as there already exists a schema format for specifying the shape of JSON data. BizTalk Server prefers working with XSD, and makes no exception for JSON. Surprisingly this XSD looks no different than any other XSD, and contains no special annotations to reflect the message being typically represented as JSON content. 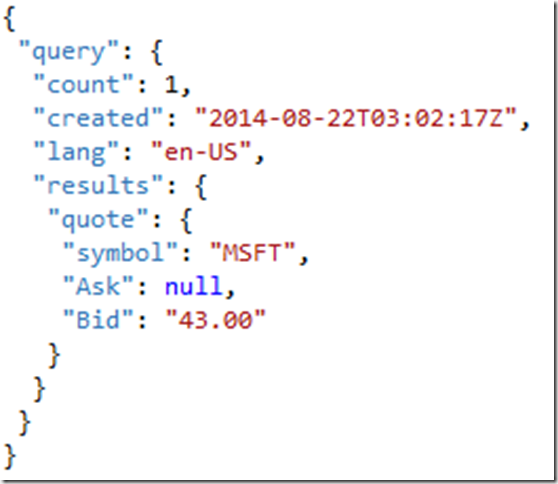 What Does a JSON Schema Look Like? This is a pretty simple instance, and it is also an interesting case because it has a null property Ask, as well as a repeating record quote that does not actually repeat in this instance. I went ahead and saved this snippet to the worst place possible – my Desktop – as quote.json and then created a new Empty BizTalk Server Project in Microsoft Visual Studio 2003 (with the recently released Update 3). The wizard looks surprisingly like the Flat-file schema wizard, and it looks like quite a bit of that work might have been lifted and re-purposed for the JSON schema wizard. What’s nice about this wizard though, is that this is really the only page requiring input (the previous page is the obligatory Welcome screen) – so you won’t be walking through the input document while also recursively walking through the wizard. Instead the wizard makes some core assumptions about what the schema should look like (much like the WFX schema generator). In the case of this instance, it’s not looking so great. Besides from essentially every single element being optional in the schema, the quote record was not set as having a maxOccurs of unbounded – though this should really be expected given that our input instance gave no indication of this. However, maybe you’re of the opinion that the wizard may have been written to infer that upon noticing it was a child of a record with a plural name – which might be an interesting option to see. Next the Ask record included was typed as anyType instead of decimal – which again should be expected given that it was simply null in the input instance. However, maybe this could be an opportunity to add pages to the wizard asking for the proper type of any null items in the input instance. Essentially, it may take some initial massaging to get everything in place and happy. After tweaking the minOccurs and maxOccurs, as well as types assigned to each node, I decided it would be a good time to ensure that my modifications would still yield a schema that would properly validate the input instance I provided to the wizard. How do We Test These Schemas Or Validate Our JSON Instances? Quite simply, you don’t. At least not using the typical Validate Instance option available in the Solution Explorer context-menu for the .xsd file. Instead this will require a little bit of work in custom-code. Where am I writing that custom code? Well right now I’m on-site in Enterprise, Alabama teaching a class that involves a lot of automated testing. As a result, I’m in the mood for writing some unit tests for the schema – which also means updating the project properties so that the class generated for the schema derives from TestableSchemaBase and adds a method we can use to quickly validate an instance against the schema. That’s not all the setup required unfortunately. I still have to add a new TestSettings file to the solution, ensure that deployment is enabled, that it is deploying the bolded Microsoft.BizTalk.TOM.dll assembly above, and that it is configured to run tests in a 32-bit hosts. From there I need to click TEST > Test Settings > Select Test Settings File, to select the added TestSettings file. With all the references in place and the solution all setup, I’ll want to bring in the message instance(s) to validate. In order to ensure that the test has access to these items at runtime, I will add the applicable DeploymentItem attribute to each test case that requires one. Here in the code we’re converting our JSON instance first to XML using the Newtonsoft.Json library. 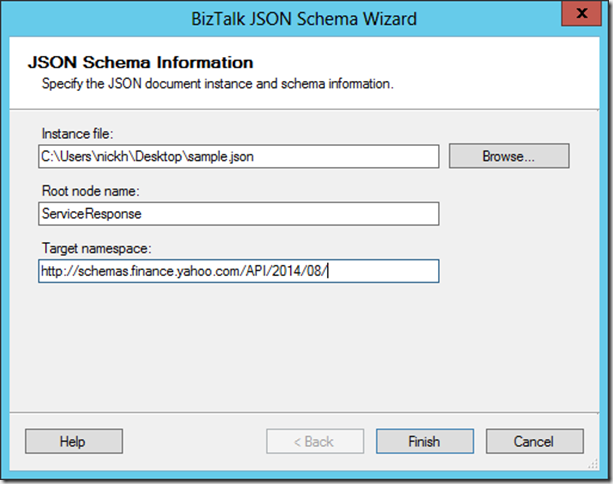 Once it is in an XML format, it should (in theory at least) conform to the schema definition generated by the BizTalk JSON Schema Wizard. So from there, we take output XML, and feed it into the ValidateInstance method of the schema to perform validation. The nice thing about doing it this way, is that you will not only get a copy of the file to use within the automated test itself, but you can also use the file generated within the test in concert with the Validate Input Instance option of the schema for performing quick manual verifications as well. Next week will be part 2 of the JSON series in which we will test and then use this schema in concert with the tools that BizTalk Server 2013 R2 provides for consuming JSON content.